Thursday I met up with Dan and Ashley from Bison Brewing, Carlo and Geneva of Savor Oakland food tours, and the folks at Forge Pizza in Jack London Square to talk about Meatless Mondays, food and beer pairings, and supporting local businesses. Bison founder and Chief Hoperations Officer Dan Del Grande told us a bit about the Meatless Monday movement. The name started during WWI, when the U.S. government encouraged people to eat fewer key staples like meat ("Meatless Mondays") and wheat ("Wheatless Wednesdays") to help feed the troops in Europe. The idea returned during WWII and went through the post-war years to help feed war-torn Europe. The modern movement in the U.S. began in 2003, with the message of "one day a week, cut out meat" as a way for individuals to do something good for themselves and for the planet. The movement got a big boost in 2009 when Paul McCartney and his daughters started a Meat Free Monday campaign. Raising cattle, pigs and other animals for meat takes a lot of resources and take a toll on the environment. One of those resources is water, something of interest to every Californian; raising a pound of beef takes somewhere between 1,800 and 2,500 gallons of water. Eating less meat is a way to reduce the impact on the planet. That's the main reason I've been vegetarian for over a decade. But reducing your meat intake by 1/7th is even easier. Dan has been doing #MeatlessMonday for years, but that's not the only way Bison Brewing practices sustainability. Bison was one the first U.S. breweries to be certified fully organic (finding organic hops was a problem). Bison is also a certified B Corporation, meaning they have to meet rigorous standards of social and environmental performance, accountability, and transparency. Next, we talked about food and beer pairings. It's not just the right wine that can compliment food; so can the right beer. Imagine one of Forge Oakland's margherita pizzas, accompanied by a Bison Honey Basil or two. Or a Chicory Salad and a Saison de Wench. All of the spec sheets for Bison's beers include suggested food pairings, and not just vegi options. I'm wondering which beer would go best with their awesome Cauliflower pizza—maybe a Chocolate Stout? Finally, (all the while sampling Bison's various tasty brews), we heard the stories behind some of the beers. When Bison first went organic, the hardest thing to get was organic hops; that's part of why some of Bison's early beers aren't very hoppy. When they finally could get organic hops, they got a lot. And hence Kermit the Hop Double IPA was born. Bison has been doing different Saison-style beers each year for a while. This year's was inspired and created by Bison's Director of Awesomeness, Ashley Rouston (aka @TheBeerWench), based on Bison's farmhouse ale. Saison beers were originally made with whatever was in season, and in springtime that meant lots of flowers and botanicals. This Saison includes rose petals, lemongrass and hibiscus! I don't know what's next for the #MeatlessMonday movement in Oakland and the East Bay, but you can do your part any day of the week. 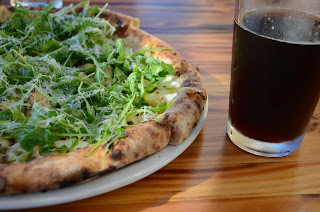 The Savor Oakland food tours of Jack London Square includes a stop at Forge Pizza; hopefully soon you'll be able to add a Bison beer to go with your sample, and triple the local (and meatless!) love.